Most of Core Data examples online or in textbooks are mostly all built using a navigation view controller (UINavigationController). They also feature a UITable and or a UITableView as part of their design. But what if you wanted to create an iPhone or iPad app which doesn’t use these elements? Or what if you needed to create a Core Data app from scratch? Or you wanted to add Core Data to an existing app? All valid questions. They are all answered with this tutorial. In fact this tutorial shows how to build a Core Data app from scratch using a Single View Controller. It takes you through all the easy steps to setup Core Data in a new or existing app that doesn’t use a navigation controller or a table view or table view controller. This tutorial will demonstrate how to setup Core Data from scratch and store audio files in a Core Data storage facility. In the next tutorial I will fetch and playback the audio files. The first step towards adding Core Data to a project is adding the Core Data framework. You can accomplish this selecting the project root in the navigator, then select the application target and scroll down on the Summary page to the Linked Frameworks and Libraries section and click on the + button. 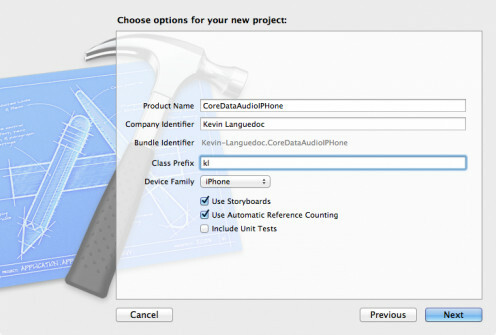 In the popup, type in the Core Data in the search field and click the “Add” button to add the framework to the project. The library will be added to the Resource folder, so select it and drag it to the Frameworks group in the Navigator. See the adjacent screenshot below. Building a Core Data application requires a Data Model file which will allow you to define the Entities, Attributes, Relationships and Predicates. The template is located in the New File popover under Core Data in the iOS group. The name of the Data Model file is important since you must use it explicitly later on in the Application Delegate when loading the Managed Model into memory when the application is launched. Once the file is created, you will see it in the project navigator. It has a “xcdatamodeld” file extension. Open it and add an Entity, which will be represented in the SQLite database as the table. To create an Entity, click on the “Add Entity” button at the bottom of the page. The Entity name must start with a Capital letter. For this tutorial, I will create an Entity called “Audios” so that I may store audio files in my Core Data storage facility. The second part of data model for this tutorial is to add Attributes to the Entity. You can view Attributes as being the columns in the table(s) in the SQLite storage facility. By contrast Attribute names must start with lowercase letter. Attributes can be added by clicking on the “Add Attribute” button at the bottom of the page or by clicking on the “+” sign in the Attribute section. For this tutorial I will add two Attributes, one called “name” and will have a string data type and the other will be called “audioFile” and will have a Binary Data data type to hold the actual binary representation of the audio file. 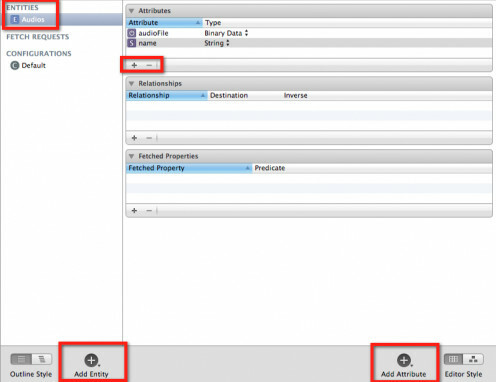 Take a look at the screenshot below to see how the data model should be laid out in the Core Data Editor. For this tutorial we don’t need any relationships or predicates. The next part will setup the Core Data objects in the Application Delegate. 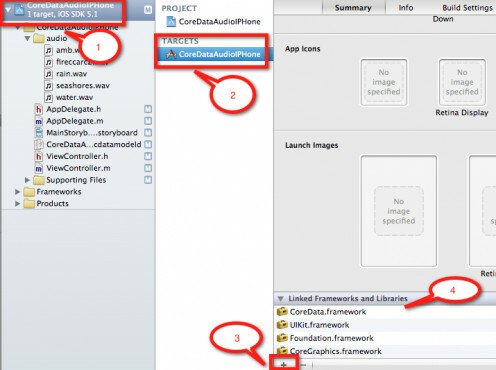 It is also crucial to add the CoreData framework to the CoreDataAudioIPHone-Prefix.pch file. This file is used by iOS applications to precompile the app during the compilation. Precompilation is a technique to accelerate the compilation process. #warning "This project uses features only available in iOS SDK 5.0 and later." 3-Add a NSManagedObjectContext instance variable as nonatomic, retain and readonly. 4-Add a NSManagedObjectModel instance variable as nonatomic, retain and readonly. 5-Add a NSPersistentStoreCoordinator instance variable as nonatomic, retain and readonly. 6-Next add a method, applicationDocumentsDirectory, that will return the path as a NSURL of the SQLite database that will be used by Core Data. 7-Lastly, create another method, saveContext, to capture the current configuration of the current context to save as the application gets unloaded. The next major step involves implementing the Core Data code in the AppDelegate implementation file. This file includes many crucial pieces of code and many required methods to make your Core Data application work properly. Notice how the ViewController header is imported. This is important as we will need to define which view controller (or navigation view controller) will be the root view controller. The next lines of code sets up the instance variables that will be used by Core Data. Since this example is using only using a view controller, we will start creating a new ViewController object and defining it as the root view controller for the application. Then we will set the managedObjectContext of the root controller to the managedObjectContext variable. This line of code will trigger the app to call the other required methods, that we will look next, to setup the Core Data objects. The managedObjectContext method and its associated code is provided as is. Meaning all you need to do is copy and paste into the AppDelegate implementation file. The code will setup and return the context and create the related NSPersistentStoreCoordinator. The managedObjectModel method returns the object model or creates it if doesn’t exist. Here you need to add the name of your object model. 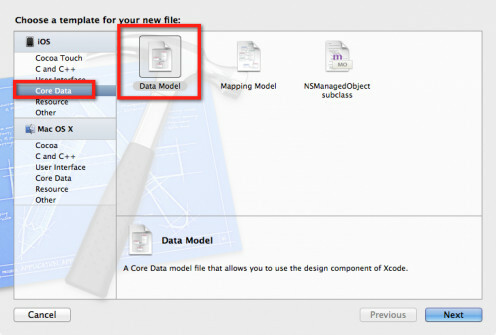 In this tutorial it is “CoreDataAudioIPHoneDM” which is the name of the Core Data model filename without the extension. It is important to specify the exact same name as the object model filename or your application will crash. The persistentStoreCoordinator method creates or returns the persistentStoreCoordinator object which is the Sqlite database. The name of the SQLite database is usually the name of the application, so we will continue to this practice and change the name of the database to our application name. You don’t need to change anything else in the code except that in a production app you would need to replace the abort() method by a popover or a UIAlertView information the user that the application has crashed and they need to click on the “Home” to reset the application. //and ask users to quick app using the home button. This method isn’t strictly required. It is considered a helper method as is returns the path of the Documents directory that is used in the persistentStoreCoordinator method to setup and initialize the SQLite database. The saveContext is not a required method but is can be used when the application is closing down to save state and content changes. The above methods and variables are the necessary components to successfully setup and use Core Data in an application. The remaining of the tutorial demonstrate how to implement the Core Data configuration. The application, which by the way is not recommended for a production grade app, will allow a user to select an audio filename using an UIPickerView control and saves the binary representation of the audio file in a Core Data storage facility. This is only for demonstration purposes because in a real app this technique would eat up the system resource in an alarming rate, but you can use the same technique with other types of file or data. Next we will define four instance variables. One for the NSFetchedResultsController and another one for the NSManagedObjectContext which are the minimum implementation requirements. The app will also need an array variable to be used as a data source for the UIPickerView and finally we will create an IBOutlet for the UIPickerView which is the last instance variable. To handle the Core Data operations for storing data, we will create two methods: getAudioBinary which will return the binary representation of the audio file and will be used in the insertNewManagedObject method to store the data. The code for the header file is listed below. The final of the development of this app involves implementing the Core Data stack in the ViewController implementation file. Other than the custom instance method that we have declared in the header file, the application will use the ViewController’s viewDidLoad method to setup the UIPickerView and will also implement the UIPickerViewDelegate required method which we will look at in the following sections. First thought we will need to synthesize our variables at the top of the implementation file right after the ViewController @implementation directive. Also we will need to import the CoreData library. See the code listing below. The viewDidLoad is the workhorse for the app. 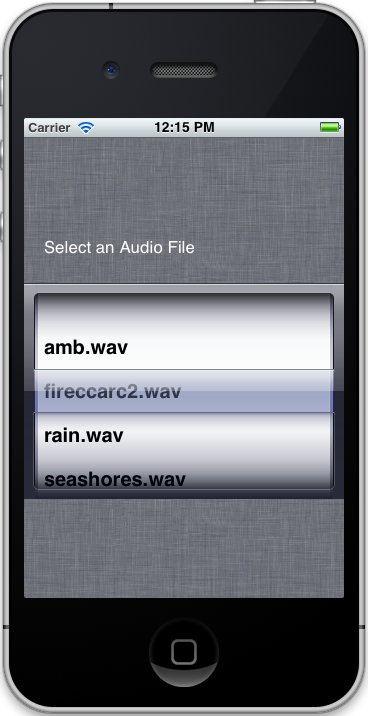 The first variable, a NSString called root, gets a handle on the Resource folder where the audio files are located. The next line defines a NSFileManager variable which we will use to get the contents of the Resource directory using the contentsOfDirectoryAtPath passing in the root path. This will return all contents as an array (NSArray) but since we only want the audio files, we will use a NSPredicate to apply a filter to the dirContents NSArray, which we will assign to another NSArray, onlyAudioFiles. We will use the onlyAudioFiles as our data source for the UIPickerView. The last line initializes the UIPickerView and since we have implemented the UIPickerViewDelegate, this will trigger the required instance methods that we will look at in the next section. The code for the viewDidLoad method is listed below. is partially optional. By this I mean you can either implement this method or the – pickerView:viewForRow:forComponent:reusingView:. These methods are used to assign the content to the UIPickerView. For this example we will use the former which will assign the contents of the onlyAudioFiles NSArray. The code for the method implementation is provided below. The other method that must be implemented in the delegate is the pickerView:didSelectRow:inComponent: which is called when a user selects an item in the UIPickerView. The method returns the name of the selected item and will pass it to the insertNewManagedObject method, see the code below. The other protocol implemented is the UIPickerViewDataSource. This protocol implements the numberOfRowsInComponent method which is the number of columns to display in the UIPickerView. For this tutorial, we will set it to 1. The pickerView:numberOfRowsInComponent: is a required method in the UIPickerViewDataSource protocol. This method returns number of rows the control will have to work with which is the number of items in the onlyAudioFiles NSArray. The code for all the method are provided below. The getAudioBinary method will be used to get the binary representation of the audio files and return as a NSData object. The method uses the filename parameter to build the complete path along with the root variable which contains the path to the Resource directory. Using the resulting filePath variable as the input parameter for the initWithContentsOfFile, the latter will return the binary representation of the file as an NSData object which will be used by the insertNewManagedObject. This method handles the interaction with Core Data SQLite database by inserting new data. The context variable is assigned the context that we have initialize in the AppDelegate that is fetched by fetchedResultsController method. Once the context is assigned, we can our entity description which returns information on the entity, the same way we use the id to decribe an object. We will use this to create a new NSManagedObject using the insertNewObjectForEntityForName method that will receive the NSEntityDescription variable, entity and the its name property. The second required parameter is the active context, or session. Once the NSManagedObject is created, it is a simple task to its attributes. The first one is name, and will contain the selected filename, and the second attribute will receive the NSData value returned by the getAudioBinary method. The rest of the code, listed below, is provided to capture any processing errors. As previously noted, replace the abort() in a production app with a popover and return directive. The user should be notified that the operation failed, possibly providing and error message anf what further actions may be taken. // Create a new instance of the entity managed by the fetched results controller. The fetchedResultsController is the last method that we must implement to make our Core Data implementation work. This method fetches the entity that we will use to save our data. This method handles the return messages or query results from Core Data. You can use the code as is, replacing the value for the entity that you need to use. You can also set the sort attribute. Set up the fetched results controller. // Create the fetch request for the entity. With all the pieces in place, all that is required is to run the app. With this tutorial you have all the necessary parts to either add Core Data to an existing application or to add Core Data to a new application without using a pre existing template. Also this tutorial assumes you aren't using a Navigation Controller or a Tabbed Navigator. Hi I have tried to implement this into an existing programme but get this error -[UINavigationController setManagedObjectContext:]: unrecognized selector sent to instance 0x952c900 can you help? I am a graduate student. Sir please upload the code for my task " When the user selects a date from the datepicker he has to navigate to a new viewcontroller showing the selected date " please help me for this issue. I searched a lot but i couldn't find the answer if you post this answer it will help me a lot for getting a job for me. Still didn't figure out about recording audio, please can you tell me if the song is save in document directory how to take the path and store in a tableview? Thanks it will be very helpful. I will put together a tutorial for you. Thank you very much for your replay i really appreciate. I've seen your tutorial where you use images the problem is that your images are in Resource what i want when i record audio and press save the audio to go in a table view. Very helpful tutorial, i'm trying to use the technique to record audio files ans store with core data but no success. Can you help me?Do you have a tutorial about this? the process outlined in the article is the same for a new or existing app. for an existing app, add an import statement to your (existing) tab controller in the appDelegate. In the didFinishWithOptions create a new instance of your tab controller and set it as the root as in the example above. Very helpful. Thanks. In your intro paragraphs you say that you will show how to add core data to an existing app. I don't see where you show that. I have an existing app that has a tab controller in an existing storyboard. I don't see how I can instantiate those from AppDelegate.m to get the CoreData stuff into them. I'm a relative newb. should complete by next week. Hey man did you finish your tutorial? Thanks, the next tutorial should be interesting I was unaware iOS supported playing .wav files!